I found Linux Mint 18.1 to be the best Linux-based distribution for average PC users who basically want things to work out of the box. It’s for those who don’t need to learn new tricks to do the same job. I used to be a distro hopper, looking for new exciting distributions, never satisfied with the one I had. I also used to spend a majority of my free time fixing those distros. I don’t have the luxury of free time anymore. I don't have hours to spend making my operating system function. These days I use what works and I have settled on a few distributions: CentOS for my production server, Ubuntu for the home server, and my main system dual boots with Arch Linux and openSUSE Tumbleweed. So where does Linux Mint fit into this jigsaw puzzle? I found Linux Mint 18.1 to be the best Linux-based distribution for average PC users who basically want things to work out of the box. It’s for those who don’t need to learn new tricks to do the same job. At the same time, Linux Mint (Cinnamon) is aesthetically pleasant to use, and it is achieved without reinventing the wheel. There are many Linux distributions that exist purely for the sake of look and feel without bringing any new functionality to the table — nothing that can’t be done on any other Linux distribution out there. On the contrary, Linux Mint Cinnamon does offer more to those who want a usable Ubuntu+Gnome experience. It’s a perfect and highly recommended distribution for those Windows users who are not comfortable with the way Microsoft tracks them. It’s also a great distribution for those desktop Linux users who have shopped around and now want to settle down. It’s a very stable and trustworthy distribution, something you may need even more if you travel a lot and don’t want your laptop breaking in the middle of nowhere. While I use Linux desktop on my main PC, I travel with a Macbook Pro just to make sure I won’t have to worry about audio or networking not working during a conference. You will find hundreds of YouTube videos where Linux ‘experts’ were struggling throughout the video to get audio to work on their systems. But if I am forced to pick a Linux distro instead of macOS for my travel laptop I will undoubtedly choose Linux Mint (along with Arch Linux, can’t live without Arch). Why? Because the Linux Mint team has worked hard to create a system that just works. Linux Mint has never failed me. Never. What’s new in 18.1 Serena? Linux Mint comes in different flavors, but Cinnamon and MATE are two of the primary ones. Mint 18.1 comes with Cinnamon 3.2 and Mate 1.16. The Cinnamon edition of Linux Mint offers many cosmetic improvements. This isn't something I, personally, care much about. I really don’t care about new features like crossfade animations for background changes or fade effects for edges of applications in the main menu. What I do care about is stability and new functionality to enhance my workflow. Those who come from Ubuntu Unity, or have used the vertical menu on macOS or Windows 10, can now enjoy the vertical menu experience on Linux Mint Cinnamon. I prefer vertical menus as these odd 16:9 screens waste way too much horizontal space. I loved added support for 'libinput' touchpad and input driver, in addition to ‘synaptics’. I am also expecting a better experience on my Dell XPS 13 Kaby Lake. Other improvements that I liked from a user's perspective is the ability to control multiple audio/video players from the sound applet and switch between them. What I do miss is the inability to batch-rename files. I have been requesting this feature for ages and the Gnome team implemented it in 3.22. I am using this feature on both openSUSE Tumbleweed and Arch Linux. I also miss the Gnome Files feature where you can mount Google Drive as a remote folder. This is the reason why I am not a huge fan of distros using older packages and it is why I don’t use Linux Mint on my main desktop and instead stick with openSUSE Tumbleweed and Arch Linux. What’s the point of a Linux distribution that can’t even offer well tested and stable new features? Linux Mint comes with a large stock of applications pre-installed. It comes with LibreOffice, GIMP, VLC and Firefox, among others, which means you can start your work as soon as you boot into Linux Mint Cinnamon. If you need more, you can easily install needed packages from the Software manager or via the command line. Thanks to the Ubuntu base, Linux Mint users have access to hundreds of packages that are available for Ubuntu. The only disappointing feature is the default search engine. Instead of offering Google, Linux Mint has a deal with Yahoo! and that is used as the default search engine. Looking at this screenshot, I am not convinced how much should I trust their default search engine. 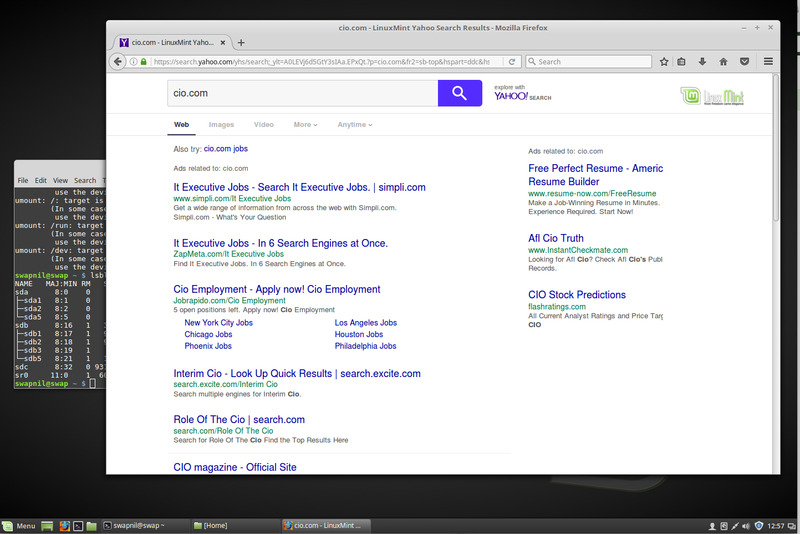 When I searched for CIO.com, the actual site is buried under ads. What’s worse is that Linux Mint makes it really difficult to switch to Google. Other than the default search engine, my only gripe with Linux Mint is the approach towards updates and upgrades. It’s 2017, we are discovering more bugs in Linux than ever before and we are creating governments that are hostile towards privacy. In times like these, we should educate users about the importance of updates and upgrades and encourage them to always run up-to-date systems instead of instilling the idea of ‘don’t fix if it’s not broken.’ In the world of software, there is always something broken, there are bugs that can turn into security concerns. Some bugs that are not yet identified as security concerns don’t get patched through updates. There are serious bugs that get fixed through kernel updates and Linux Mint heavily discourages such updates. Linux Mint should invest time and resources to build a system that offers smooth and painless updates and upgrades. Instead of wasting time releasing 3-4 versions of Linux Mint based on the same Ubuntu 16.04, it may be more useful to make only one release per LTS and create a model similar to Chrome OS/Core OS where users always run the latest and safest packages without any worries of broken systems. As much as I love and recommend Linux Mint, this is my biggest complaint with the project. My advice to anyone reading this article is to keep your systems updated and upgraded. If you come across issues let the developers know and request that they fix them. If things break too much between upgrades, consider switching to a different distro. That said, Linux Mint is one of the most highly recommended distros out there. If you have not tried it yet, try it today.